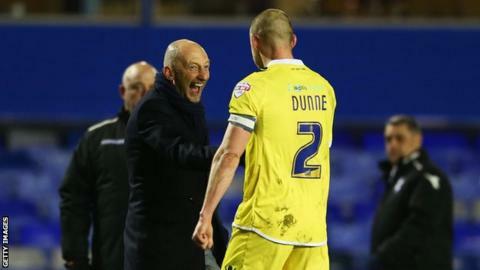 Relegation-threatened Millwall claimed a second win in three Championship games as Alan Dunne's second-half goal proved enough to beat Birmingham. The captain headed home when Birmingham failed to clear a ball swung into a crowded goalmouth. Millwall remain in the relegation zone only because of an inferior goal difference to fourth-bottom Brighton. Birmingham, who are 11th in the table, have taken four points from their last five matches. They have not won since beating Wigan on 10 January. Under-pressure Millwall boss Ian Holloway, meanwhile, can be heartened by his side's resilient performance. Martyn Woolford went close to giving the Lions a first-half lead when his clever lob hit the bar, before Dunne struck 10 minutes into the second half. Birmingham threatened a late equaliser as Jonathan Grounds's header from a corner hit the woodwork. "It was a frustrating night and a frustrating performance in many ways. I felt when we went out from the start it felt a little bit flat and felt a little bit as though we were going to turn up and win the game. "It just doesn't happen like that. I thought Millwall blocked the game up well and it was very difficult for us to find space and we just didn't move the ball quick enough. "We didn't cause them enough problems in the final third and that was the most disappointing thing. "Games like that are going to happen and we have to try and find a solution. It was a poor goal to concede and from then on we huffed and puffed." "We had to ride a couple of things, like our record here. We have not won here since 1968 and that is pretty scary. They hit the bar, that was scary, but on the whole I was really pleased with the response of my lads. "We are a new group and we are learning and we came here against a really good side. I don't think Birmingham played poorly. I don't think we allowed them to play and I thought we played well. "That is the Championship. Anyone can beat anyone on a given day and what we need to try and do is win at home. It is pretty heartbreaking for our fans. The ones who come away are quite enjoying it." Offside, Birmingham City. Darren Randolph tries a through ball, but Nikola Zigic is caught offside. Attempt missed. David Cotterill (Birmingham City) right footed shot from outside the box is too high from a direct free kick. Foul by Michael Tonge (Millwall). Offside, Millwall. Shaun Williams tries a through ball, but Martyn Woolford is caught offside. Shaun Cummings (Millwall) is shown the yellow card. Substitution, Millwall. Nadjim Abdou replaces Diego Fabbrini because of an injury. Hand ball by Diego Fabbrini (Millwall). Foul by Jos Hooiveld (Millwall). Offside, Millwall. Martyn Woolford tries a through ball, but Lee Gregory is caught offside. Attempt missed. Lee Gregory (Millwall) header from a difficult angle on the right is too high. Assisted by Martyn Woolford with a headed pass following a set piece situation. Substitution, Millwall. Mark Beevers replaces Lee Martin. Attempt missed. Diego Fabbrini (Millwall) right footed shot from the right side of the box misses to the left. Attempt saved. Lee Gregory (Millwall) right footed shot from very close range is saved in the bottom left corner. Assisted by Shaun Cummings with a cross. Jonathan Grounds (Birmingham City) hits the bar with a header from the centre of the box. Assisted by David Cotterill with a cross following a corner. Corner, Birmingham City. Conceded by Dan Harding. Substitution, Millwall. Lee Gregory replaces Stefan Maierhofer. Offside, Millwall. Martyn Woolford tries a through ball, but Stefan Maierhofer is caught offside. Diego Fabbrini (Millwall) wins a free kick in the defensive half. Attempt missed. David Davis (Birmingham City) left footed shot from outside the box is close, but misses to the right. Corner, Birmingham City. Conceded by Alan Dunne. Attempt saved. Lee Novak (Birmingham City) header from the centre of the box is saved in the bottom right corner. Assisted by David Cotterill with a cross. Substitution, Birmingham City. Lee Novak replaces Lloyd Dyer.